Ragda pattice is a popular breakfast dish from marathi cuisine. 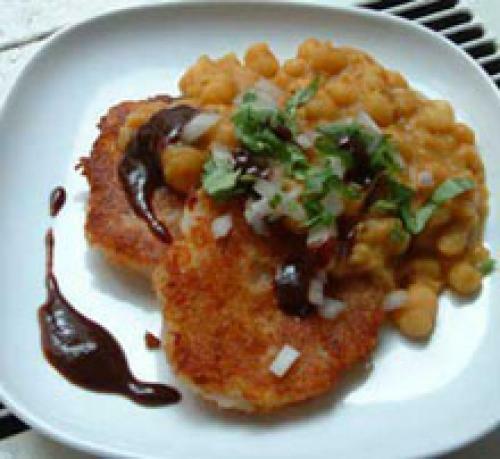 potato cutlets are topped with ragda (dried peas) and garnished with tamarind chutney, finely chopped onion, coriander leaves and sev. wash and soak dried peas in water for 8-10 hours or leave it over night. drain soaked peas and transfer them to pressure cooker, add four cups of water, salt and a pinch of soda. pressure cook it for 5 whistles, until the peas turn soft. do not drain the water as it can be used later. heat oil in a wok, add mustard seed, curry leaves and asafetida. when mustard seed starts to splatter add onion, chili and ginger garlic paste. saute for 3-4 minute, till the onions are translucent. add cooked white peas along with water that is been left from cooker. add red chili powder, cumin powder, coriander powder, black salt, pepper powder, salt, turmeric powder and garam masala. mix all the ingredients well. mash some peas with a back of spoon to make thicker ragda. add 1 cup of water in it. mix well. let the mixture cook over medium flame for 10 minute until gravy turns thick. peel and mash boiled potatoes. add green chili, salt, grated ginger, corn flour, salt, bread crumbs, and turmeric. mix all the ingredients well. divide mashed potato mixture into 12 equal portions and give them a shape of round ball. press them little using palms to make 1 inch thick flat round shape patties. shallow fry pattice on a non - stick griddle over medium flame using small amount of oil. fry until potato pattice are crisp and golden brown on both sides. place two patties on a plate, top with a spoon full of ragada over it. then garnish it with tamarind chutney, finely chopped onion, coriander leaves and sev. sprinkle chat masala over it.